"Dear fellow gearhead, ever hear the phrase: 'Everything is bigger in Texas'? To us Texans it's not just a phrase, it's how we roll. We like our friends and our stuff and we like to take it all with us when we go places. We also like speed and performance." Besides the 20-inch wheels, a flurry of badges and red brake calipers, there's nothing else on the visual menu, but what really counts is the tune under the hood. The HPE550 package gives the stock 6.2-liter V8 engine a belt-driven supercharger producing 6 psi of boost pressure, together with an ECU remap, air-to-water intercooler system and different gaskets, to lift output from 420hp and 460 lb-ft to 557hp and 542 lb-ft of max torque. The base performance tune (HPE550) will cost you $15,950 installed and comes with a 3-year or 36,000-mile powertrain warranty, while for the 20-inch wheels, you'll need to relocate another $6,950 from your bank account. 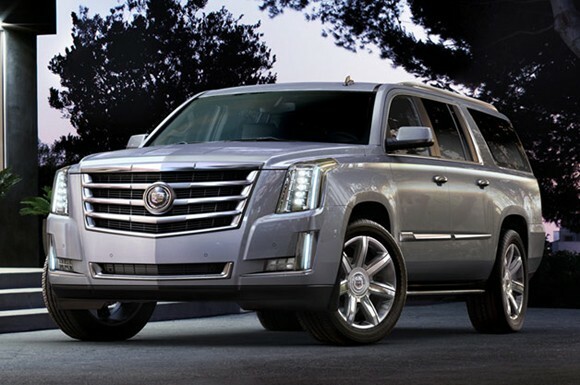 Prices for the new 2015 Escalade range from $71,695 to $92,840, so if you include the HPE550 package and wheels, the cost for driving the tuned truck run from $94,595 all the way up to $114,470.